The Great Lent is beginning soon, and will last for 40 days, until Easter Sunday, which means that I will be preparing meatless meals at least once, or twice, a week during this time. I will share with you some of my favorite meatless recipes. This recipe is very simple, and a convenient way to use up your leftover mashed potatoes. This recipe serves 2 – 4 people. On a large cutting board, or your counter top, place the mashed potatoes in a pile, and forming a well in the middle. Add flour, potato flour (corn starch), farmer's cheese, and salt. Add 1 egg and the egg yolk into the formed well, and beat slightly with a fork to blend the yolks with the whites. Using a spoon, work in the rest of the potatoes, cheese, and flour, until dough is formed. If the dough is sticking to your board, sprinkle some flour on the board and work into the dough. Rest the dough for about 5 minutes, by placing it on floured board and covering it with a tea towel (dish towel). Scrape off and discard any remnants of the dough from your cutting board. Sprinkle the board generously with flour. Cut the dough in half, and roll out into a log, one inch in diameter. Using a knife, cut the log crosswise into ½ inch wide chunks. Scatter them on the floured board, so they do not touch each other, and sprinkle over them with additional flour. Let them rest for few minutes. Fill a 2 quart pot with water, add a little salt, and bring to boil. Drop half of the dumplings into the boiling water, stir with a wooden spoon, so they do not stick to the bottom, and wait until they will rise to the top. Remove dumplings with a slotted spoon into a colander over a bowl, and let them drain. Bring the water to boiling once again, and repeat the above process for the second batch of dumplings. Melt the butter in a frying pan, and sauté the onions to a nice golden color. 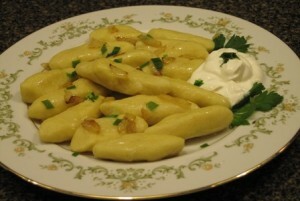 Serve dumplings with the sautéed onions, and a generous dollop of sour cream. For richer dough, you can add ½ cup of farmer cheese, or dry cottage cheese, to this recipe. 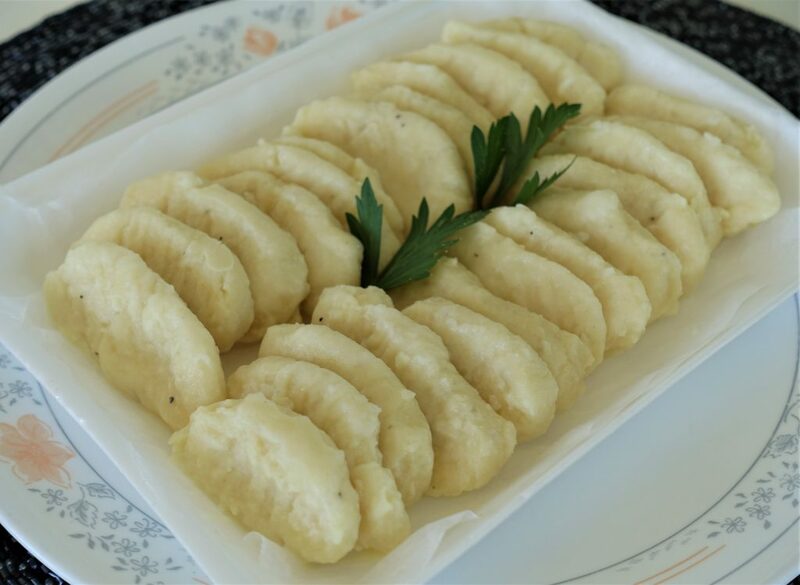 If you like these dumplings crispy, rather than soft as cooked, you may lightly brown them in butter, and serve them hot with a dollop of sour cream, sauteed onions, mushroom gravy, tomato sauce, or salsa. I’ll have to try to make these sometime soon. They sound a bit like large gnocchi, but with yummy fried onions instead of tomato sauce! You are correct…. these are very similar to gnocchi. You can shape them any way you like. You can even make them into balls filled with fruit, such as canned plums, or fresh blueberries or strawberries, and serve them sprinkled with sugar. When I lived in PA for a couple of years I knew a lady that made these every year on New Year’s Day. I’ll have to make them one day and I really enjoyed the memories that you brought back. My sister-in-law gave me that recipe, and it is an easy dish to prepare. Have fun making it, while reminiscing.